Antakya, Asharq Al-Awsat—A Syrian rebel group calling itself the Ahrar Al-Qalamoun Brigade has claimed to be behind the abduction of 12 Greek Orthodox nuns earlier this week. The Islamist group announced that it is prepared to release the nuns in return for the release of one thousand female detainees held by Syrian President Bashar Al-Assad’s government. Fida’a added that the group’s demands have been conveyed to the Assad regime via the Vatican. 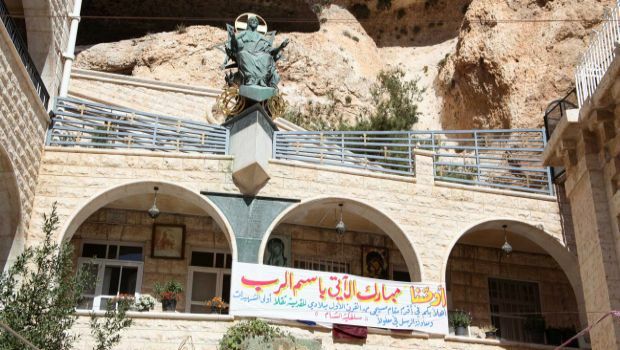 He revealed that Ahrar Al-Qalamoun had established contact with head of the St. Thecla (Mar Takla) monastery in Maaloula, Mother Pelagia Sayyaf, who in turn had contacted the Vatican by satellite phone. Although Ahrar Al-Qalamoun is not a well-known group, Fida’a clarified that it enjoys strong ties with the Al-Qaeda affiliated Al-Nusra Front. “These are joint demands from Ahrar Al-Qalamoun and the Al-Nusra Front,” he said. The Ahrar Al-Qalamoun spokesman also informed Asharq Al-Awsat that the military commander in charge of the operation is Abu Mohamed, adding that commander Abu Azzam is responsible for the nuns’ safety. The Orthodox nuns had been feared kidnapped on Monday after Syrian rebel groups, including Ahrar Al-Qalamoun and the Al-Nusra Front, recaptured the Christian town of Maaloula, north of Damascus, following three days of heavy clashes with Assad forces. Initial reports were unclear as to whether the nuns, along with orphans in their care, had been forcibly abducted or evacuated for their own safety. Abu Al-Fida’a told Asharq Al-Awsat: “The nuns have been transferred to a safe place following cooperation between Ahrar Al-Qalamoun and the Al-Nusra front, as Maaloula might be subject to bombing by the regime,” adding this had taken place in response to a Vatican request and denying that the nuns have been moved to Yabrud. Sources also informed Asharq Al-Awsat that the Al-Nusra Front had included a number of other conditions for the release of the 12 nuns, including for the Assad government to suspend its siege on a number of strategic areas, including the Ghouta district of Eastern Damascus, allowing much-needed food and other aid to enter. Zehouri, who is a field reporter who covered both the battles of Al-Qusayr and Qalamoun, warned that the nuns could be killed by regime bombing of the area. Earlier this week, Catholic Pope Frances called for prayers for the 12 Orthodox nuns who were forcibly removed from their convent in Syria by rebel fighters. “Let us continue to pray and to work together for peace,” the pope added.